Perfect for taking on holiday, or to carry with you on the go, Opti-Free Replenish Travel Pack contact lens solution is exceptional at cleaning, rinsing, disinfecting and reconditioning contact lenses, for everything you need in one bottle. 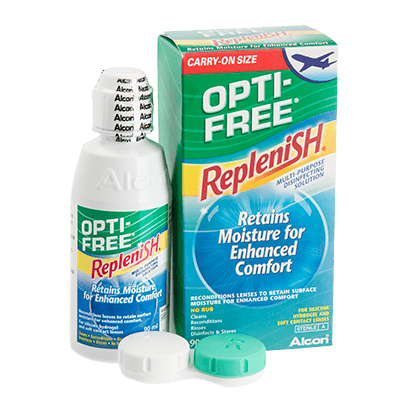 Opti-Free Replenish is suitable to use with all soft contact lenses, including silicone hydrogel lenses. The multi-purpose solution is highly effective at removing any deposits or proteins and works to destroy any bacteria that could otherwise lead to eye infections. This means you’ll be sure your eyes are in safe hands with this all-in-one solution. Alcon & Ciba Vision have used advanced TearGlyde technology for a solution that enhances and maintains the freshness and comfort of your lenses for up to 14 hours. This ultimately improves the performance of your contact lenses in retaining moisture. One of the major benefits of the travel-sized pack, which includes a 90ml bottle and a contact lens case, is its transportability. The size complies with airport regulations and is easily packed in your luggage. For those of you who’d prefer a larger supply, you can also try the standard 1-month pack available at FeelGoodContacts.ie. This is the solution I normally use but wanted a smaller pack size for my holiday. This size was perfect - used for 17 day holiday, with plenty to spare.